This statue of St. Maurice in Magdeburg Cathedral dates from around 1240 and was probably made by the anonymous sculptor of the well-known Magdeburg Rider. The sculpted features of Maurice’s face and the coloring unambiguously identify him as a black man, but this is no demeaning caricature. This naturalistic, lifelike figure is an admirable warrior armed with his characteristic spear, which he once held in his right hand. In this statue, the earliest depiction of St. Maurice as a black man, we see an innovation in medieval depictions of blackness that challenged negative stereotypes and insisted instead on a Christian egalitarianism that transcended any color difference. It is not entirely certain that St. Maurice was a real person, but according to the hagiography he was the commander of the Theban Legion in the late third century CE. The legion, which was raised in Roman Egypt, was made up of Christians at a time when Christianity had been legalized but was not yet the official faith of the empire. While stationed in Agaunum (today St. Maurice en Valais, Switzerland), they were martyred for refusing orders to persecute local Christians. About a century later St. Maurice’s remains were brought to Agaunum, later renamed St. Maurice in his honor, but he was not destined to remain a figure of local veneration. A number of German rulers adopted Maurice as their patron saint, and so his image spread across the German lands. Most notably, the tenth-century Emperor Otto I named Maurice the patron saint of the empire and also protector of Magdeburg, which was the base of his missionary work to the east. In the twelfth and thirteenth centuries, the powerful Hohenstaufen dynasty cultivated their connections to Magdeburg because they found in Maurice a champion to symbolize their expansionist aims. In their case they hoped to unite the German lands with Norman lands in southern Italy and Sicily and thereby to expand the reach of Christianity vis-à-vis Islam. It was in this context that St. Maurice became a black man where he had previously been depicted as light-skinned, first in two passages from a Regensburg chronicle (ca. 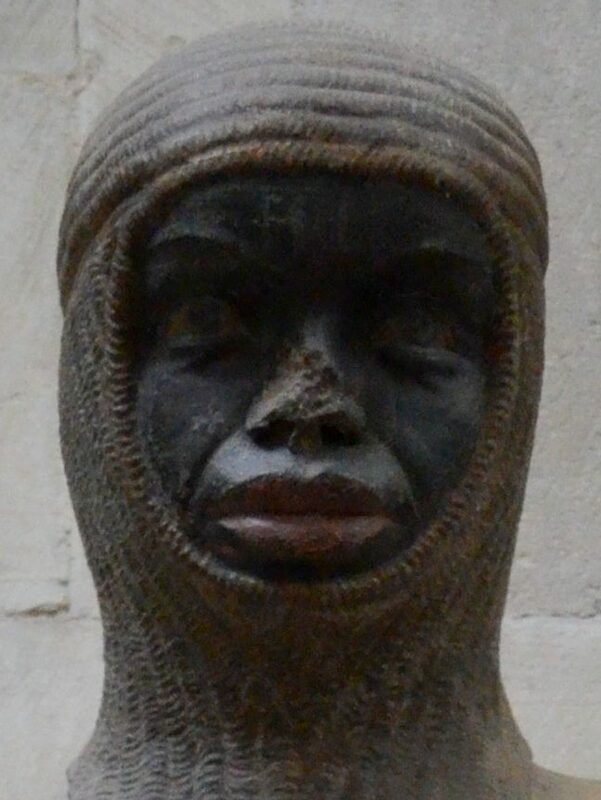 1160) that described him as the commander of a troop of “black moors” and then in this statue. It is not clear whether the statue was commissioned on Frederick’s orders, as Paul Kaplan suggests, or whether the Archbishop Albert II had commissioned the statue on his own initiative, as Gude Suckale-Redlefsen argues, but in any event the image of the black saint proved a powerful propaganda tool for the Hohenstaufen ruler. As had been true for his father Henry VI, Frederick II understood that depictions of the variety of subjects in his cosmopolitan empire were useful for buttressing his authority. By depicting this paragon of Christian strength as a black man, Frederick highlighted the reach of both his faith and his political power, a useful propaganda tool against unruly nobles and recalcitrant church officials. The idea of using a black figure to evoke cosmopolitanism and Christian universalism was not particular to Maurice; beyond the introduction of black figures in heraldry it also inspired the tradition of the Three Kings and other black saints in other parts of the German lands. The veneration of a noble Maurice remained the dominant one until the rise of the transatlantic slave trade from about the sixteenth century. Although the “traditional” image has persisted into the present, there was also a marked shift in favour of portraying Maurice in “primitive” garb. This depiction better suited a developing worldview that justified the brutalization and exploitation of black people. Sources: Terryrolf, Statue des Heiligen Mauritius and RoemkeHoekstra, Beeld van Mauritius, Magdeburg Cathedral via Wikimedia Commons. St. Maurice in Magdeburg (ca. 1240) by Jeff Bowersox is licensed under a Creative Commons Attribution-ShareAlike 4.0 International License.